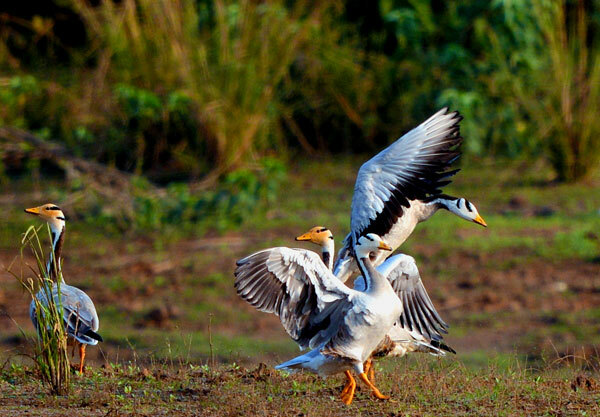 This wildlife tour covers two spectacular parks of central India Pench & Satpura, both unique & diverse. Pench is primarily a Teak forest popular for Tiger & Wild Dogs. Pench is the forest which inspired Rudyard Kiplings – The Jungle Book. Satpura is more popular for Leopards, Sloth Bear, Crocodiles & migratory birds. While in Pench the focus is on jeep safaris, Satpura offers a unique way of exploring the park by foot, boat, jeep or elephant. Day 01: Pench National Park Arrive Pench Tiger Reserve for lunch. Evening at leisure and overnight at Pench Tree Lodge. Day 02: Pench National Park Morning and evening jeep safaris in Pench Tiger Reserve. Overnight at Pench Tree Lodge. Day 03: Pench National Park Morning and evening jeep safaris in Pench Tiger Reserve. Overnight at Pench Tree Lodge. Day 04: Pench - Satpura Post breakfast drive 6 hours to Satpura Tiger Reserve. Overnight at Denwa Backwater Escape. Day 05: Satpura National Park Morning jeep safari in Satpura Tiger Reserve. Evening boat ride on Denwa River. Overnight at Denwa Backwater Escape. Day 06: Satpura National Park Morning jeep safari in Satpura Tiger Reserve. Late evening jeep safari in the bufferto spot nocturnal wildlife. Overnight at Denwa Backwater Escape. Day 07: Satpura National Park Post breakfast transfer for further connections. Nature walk as per program. Two shared safari in Satpura with entry fees, jeep charges and guide charges included. One night safari and one boat safari on Denwa river. Road transfers by air conditioned between Pench and Satpura. Pench jungles provided the inspiration to Rudyard Kiplings-The Jungle Book. Also popular for Tigers & Wild Dogs. Satpura offers a holistic wilderness experience giving guest an opportunity to walk, boat, be on an elephant or jeep inside the park. Stay in Tree Houses in Pench spread out in a large forested estate.